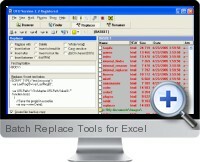 Batch Replace Tools for Excel is a plug-in for the Useful File Utilities which helps to make multiple replacement operations in Excel files with using parameters from an Excel translation table. Batch Replace Tools can really save a great deal of time: no need to open each file and make the replacement and then open the other file and so on. All can be done in few seconds and as many files as you want may be involved. 1. Create a MS Excel Translation Table. In column A enter the word or expression that should be replaced. In column B enter the word or expression it should be replaced by. The new word can be italicized or highlighted or can be printed in different color or be bold etc. in order to see it in the document when the replacement will be done. 2. Select the needed files in the main program (Useful File Utilities) – those, in which the replacement is to be done. The files can be selected by pressing 'SPACE' (names of the files become red). 3. Open Batch Replace for MS Excel in the 'Plug-ins' menu. Select the Translation Table created on the first step by pressing 'Choose' in the 'Translation Table' panel. 'Advanced options' can be used before replace is started. Marking such points as 'Set the same highlight' or 'Set the same bold style' or some other, means making the style of new words in the document like in the MS Excel table (they will be highlighted and bold). For example, if in column B of the Excel list there is the word is colored and highlighted and 'Set the same highlight' and 'Set the same color' marked, this word in the document will look just the same. But if these points aren’t marked, the word will look like the other words in the document, in which replacement should be done. Batch Replace for MS Excel has such advanced options as: size, highlight, name of font, color of font, Bold style, Italic style, Underline style. 4. Case sensitive: Batch Replacer will find and replace only words, that have the same form in letters (capital or small) as pointed in column A of MS Excel table table. 5. Having marked all the necessary options, press 'Start Replace'. 6. When the replacement is done, the Batch Replace Tools statistics are shown: size before, size after, changed size, amount of changed words or expressions and status of the document (changed or unchanged).